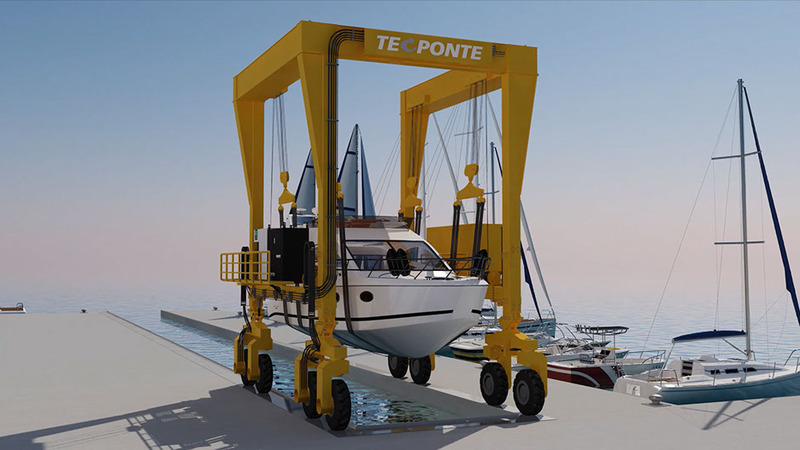 The synchronism between the hoists, ensures that all cargo-handling movements developed into uniformity. Bolted structure allows the equipment to be easily disassembled. The protection system at the wheels is important to reduce the risk of accidents and protect the wheels. The lifting movements, cross travel and crane travel are hydraulic actuation. The hydraulic pipes are stainless steel, for to increase the resistance of the machine. The joystick remote control allows to the user of the equipment, full freedom of movement and a broader view of your work. Possibility of 2 or 4 directional wheels, to permit the overall maneuverability the movements of the gantry. System with hydraulic actuation, for moving, loading, unloading and stacking stone blocks. Made by MagicBrain in Coimbra.